There are about a million things I should be doing at the moment, but I’m so buoyed by an Internet purchase, I had to share it. My dad suffers from Alzheimer’s Disease. Before her death, my mom suffered from dementia that resulted from a series of small strokes. She had other health issues, too. So, about six years ago, both my parents had to be moved into an assisted living facility. The toughest thing was not being able to take their pets. My family has always loved our animals. My siblings and I, of course, took on the pets they had at the time. About four years ago, I stumbled upon a mechanical cat that purrs, blinks and paws at its face. It’s quite lifelike. 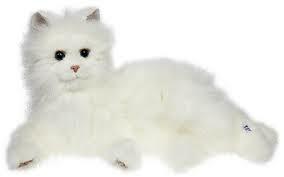 The Furreal Lulu was the spitting image of the white long-haired cat they had to give up. Also, a reviewer on Amazon had written a long comment about how her parent with Alzheimer’s had attached to it. So, I forked over the $42 to purchase it for my mother. She loved it. The mechanical cat was so lifelike from a distance, that it startled the nurses when they’d come into my parents’ room that first day. When my mother died almost three years ago, we really didn’t think my dad would survive without her. They were married only a few months shy of 50 years, and were a very close couple. But Daddy latched onto that cat and has stayed with us. We’re all very relieved, because he’s the sweetest man in the world. We have a private room for him now. He has his television and recliner and family pictures on the wall, and big portrait of him and mother. There’s also a picture of her grave, because it helps him to be able to remember where she’s gone . And, he has the cat. He holds “Silver” all day and sleeps with her at night. We’ve spent so much money on batteries, I finally coughed up a hundred bucks for batteries we can recharge and an unit to do it — only to find out he really doesn’t care if Silver moves and purrs. He just wants her company. My two sisters and I make sure he wants for nothing, but the thing he treasures most is a basket my sister gave him that hooks to his walker. He puts Silver in it and takes her with him when he goes to the dining hall for lunch every day. If we check him out of the home to spend time with us, he won’t leave without that cat. Here’s the problem. He knows the cat requires batteries and doesn’t need a litter box, but he still tries to share food with her sometimes. So, her faux fur is matted from his constant petting and her mouth is crusted with the strawberry ice cream he tries to share with her. Because of her mechanical insides, you can’t just throw her in the washing machine either. So, we’re on the third or fourth Silver. Ever so often, I’ll buy another and we’ll tell him we’re taking her to the groomer and swap it out. Until about two years ago. The company quit making the Lulu model (the one that’s laying down). Once they stopped making them, the price of the cat soared on ebay from $40 to $300. I tested getting a different one, but it wasn’t the same color and he gave it away to a lady down the hall and clung to his ratty white one. So, we’ve been attempting to scrub up this last Lulu though she’s looking really poorly. Her fur is thin in many spots. Then last night, I was cruising the Internet for something to send for his birthday later this week and, on a lark, searched for Lulu. I found one! Only $25…well, $40 with shipping. I messaged my sister — the one I know always stays up late. There was rejoicing. So, when I drive to Georgia next month, “Silver” will go to the groomer and come back fresh and fluffy. It may seem like a small thing, but its huge to the three Jackson girls because it will put a big grin on the face of the man who has loved us all unconditionally since the day we were born. We love you, Daddy. Happy 81st Birthday. I see where you girls get your sweetness from, your dad is a very sweet man! Tell him Happy Birthday for me and a kiss on the cheek! How very heart touching and beautiful Deb, he is lucky to have you and your sisters. Wiping tears as I type. Thanks, Connie. My dad is a pretty. special guy. Happy birthday to your sweet father. Hooray for a freshly groomed Lulu! It’s wonderful you were able to find something (“someone” to your dad) that keeps him happy and with you. He sounds like a very sweet man and he is lucky to have such wonderful daughters. One more reason I think you’re a rock star D. This is heartwarming and heartbreaking at the same time. Much love.